Rajasthan GK One Liners. Rajasthan GK Question in Hindi. Rajasthan GK Question PDF. 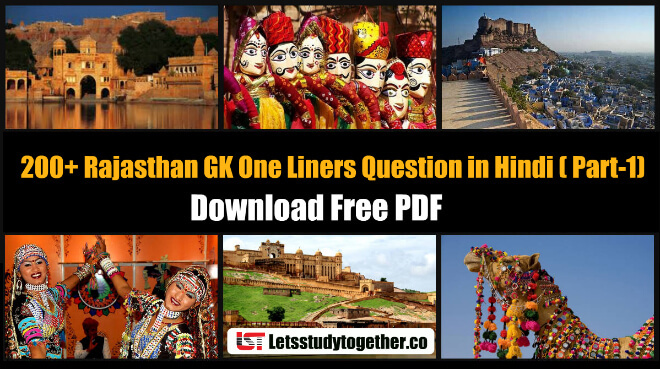 Rajasthan GK One Liners PDF. As we all know in upcoming months many Rajasthan State Exams are coming, i.e. RSMSSB Tax Assistant, Rajasthan Patwari, Rajasthan Vidyut Vibhag & other Rajasthan State exam. Rajasthan GK Questions are very important and generally asked for competitive exams. Above are the selective and very important Rajasthan GK Questions with Answers in Hindi for all types of Rajasthan State competitive exams. Questions of Rajasthan GK have been asked in competitive exams and there are chances to ask again in competitive exams as important questions are asked repeatedly in exams.